Marjie Bloy Ph.D., Senior Research Fellow, National University of Singapore. Southwell workhouse, Nottinghamshire. This was the first of the "new" workhouses in England; it preceded the 1834 Poor Law Amendment Act. Conditions there were deliberately harsh, to discourage the poor from seeking relief. 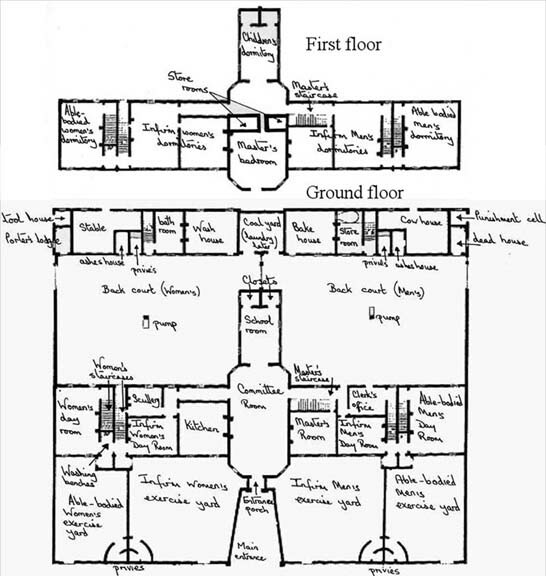 The master's quarters were situated in the centre of the building and from the windows of his rooms, he was able to see each of the exercise yards apart from one corner of the able-bodied men's yard. Families were separated in the workhouse: there was an exercise yard for able-bodied men, male 'deserving poor', able-bodied women, 'deserving poor' women and another for the children. The dividing and perimeter walls were too high for people to be able to see outside or into the other yards.